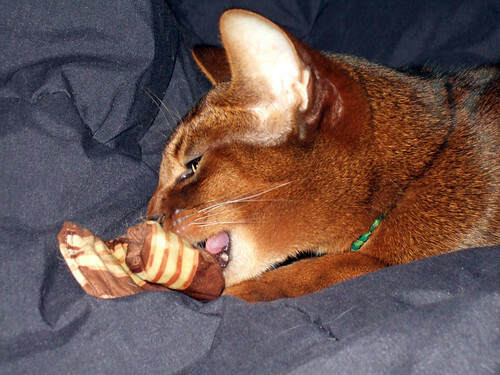 More of Jacoby and his catnip bacon…I’m not entirely sure he realises it’s not really bacon! 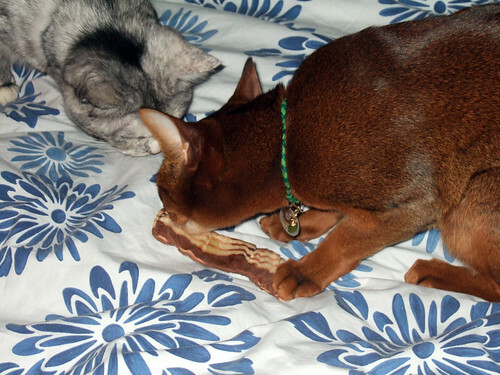 Tessie tries to figure out what’s so enchanting about fake bacon, but Jake won’t let her in close enough to find out! Look at his one paw, holding onto it so she can’t take it. One of the fun things about being an Aby person is you don’t see Abys everywhere the way you do Siamese, tabbies, tuxedo kitties and all-white cats. When you see an Aby on a package, as a stuffed animal, on a T-shirt, or in a movie, it’s kind of a big deal. Who’m I kidding? It’s pretty awesome. So of course, I collect Aby things, and one of my collections is greeting cards. Most of these I just buy when I see them, but I’ve been given a couple of them here and there – before I had any Abys of my own! This one is my newest; it’s one of those cards with sound inside. The sound really hasn’t got anything to do with the picture on the outside, but…it’s an Aby with a can opener, and that’s good enough for me!